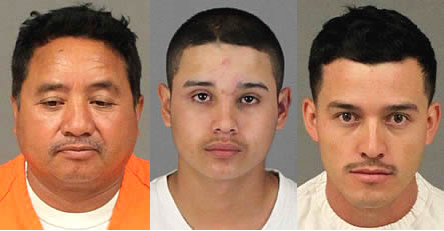 Police arrested three men in association with an illegal marijuana operation that was taking place in a rural area of Southwest Riverside County, a Sheriff’s official reported today. Deputies were patrolling in a residence in the 22000 Block of Shaw Court near McPherson Avenue in an unincorporated area of Riverside Count known as Meadowbrook, when they discovered multiple marijuana plants outside of a residential property, according to a Riverside County Sheriff’s report. The officers questioned the residents and detained three men. Juan Serrano Hernandez, 50, of Perris. Daniel Parada Villasenor, 26, of Perris. Jose Manuel Rosales, 19, of Corona. Fraker said the three men were arrested and later booked into jail at the Southwest Detention Center and animal control was called to assist with the roosters. Anyone with additional information about the incident is encouraged to contact Deputy Chavez or Deputy Hill at the Lake Elsinore Station at 951-245-3300.